Wheel Master. Valve: SV Type: Tube Only. Brake Type: CB Spoke Type: 14G UCP. Width ID (mm): 25 Axle: B/O 3/8. Hub Model: KT Steel O.L.D. : 110. 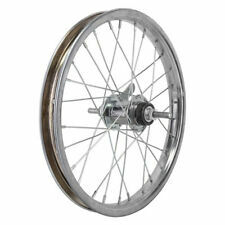 Wheelmaster 16 in Rear Wheel. Ft / Rr / St. We stand behind our products and service 100%. Spoke Count. Spoke Type. W/M SB-1000. Steel 1.75. Wheel Coaster Brake 20" BMX KT Steel 1.75 Bolt On 3/8x110x165. Rear Coaster Brake Hub KT Steel 1 Speed. Wonder Lake Bicycle. Bolt On 3/8 axle. Rim Steel 20x175. We will communicate how much more. Hub Model: KT Steel O.L.D. : 110. 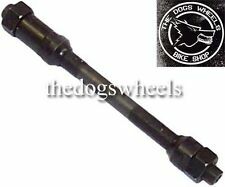 Width ID (mm): 25 Axle: B/O 3/8. Wheel Master. Valve: SV Type: Tube Only. Brake Type: CB Spoke Type: 14G UCP. For your lowrider bike bicycle. Coaster brake. 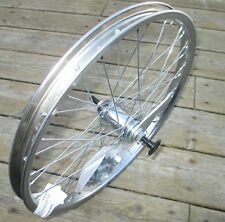 20x1.75" 72 spoke wheel. REAR WHEEL ONLY. FOR INTERNATIONAL SALES. Brake Type: CB Spoke Type: 14G UCP. Width ID (mm): 25 Axle: B/O 3/8. Size: 16x1.75. 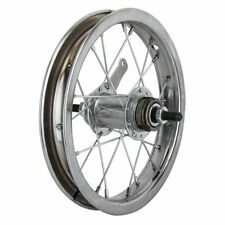 Hub: Steel 1sp Freewheel. Wheel Master. Axle Type: Bolt On. Holes: 28H. Wheel Coaster Brake 16" BMX KT Steel 1.75 Bolt On 3/8x110x170. Rear Coaster Brake Hub KT Steel 1 Speed. Wonder Lake Bicycle. Rim Steel 16x175. We will communicate how much more. Wheel Master 16" Juvenile Whl Rr 16x1.75 305x25 Stl Cp 28 Stl Fw 10mm 14gucp. Brake Type: CB Spoke Type: 14G UCP. Width ID (mm): 25 Axle: B/O 3/8. FOR INTERNATIONAL SALES. WM Wheel Rear 16x1.75 305x25 Stl Cp 28 Kt Cb 110mm 14gucp W/trim Kit. Brake Type: CB Spoke Type: 14G UCP. Rim Color: CP Rim Model: W/M Steel 1.75. Hub Model: KT Steel O.L.D. : 110. Width ID (mm): 25 Axle: B/O 3/8. Wheel Master 12" Juvenile Whl Rr 12-1/2x2-1/4 203x25 Cb W/trim Kit. WM Wheel Rear 20x1.75 406x25 Stl Cp 36 Kt Cb 110mm 14gucp W/trim Kit. Wheel Masters Whl Rr 16X1.75 305X25 Stl Cp 28 Kt Cb 110Mm 14Gucp W/Trim Kit. Wheel Masters Whl Rr 20X1.75 406X25 Stl Cp 36 Kt Cb 110Mm 14Gucp W/Trim Kit. 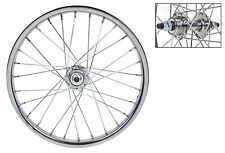 16in RR 25 B/O 3/8 CP W/M Steel 1.75 W/M SB-1000 110 CP 1s FW RIM 14G UCP 28H Sgl SV. Rear Wheel. Wheel Masters Whl Rr 12-1/2X2-1/4 203X25 Cb W/Trim Kit - FW805CPP. ETC Ball Bearings 1/4" Caged Rear Wheel Bearings in Pairs. Gear Derailleurs. Gear Hangers. Gear Shifters. Bottom Brackets. Etc Ball Bearings. You get 2 x Bearings. Colour : Silver.